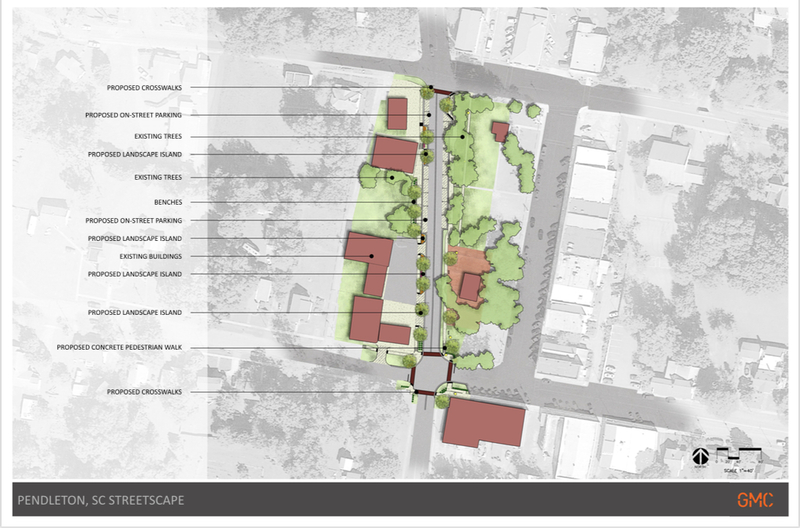 Streetscape improvements will be coming to the North Mechanic Street side of the square. The town has received a 500,000 GDBG Grant for streetscape improvements to this area. For more information on current projects please read below or attend a Town Council meeting held the first Monday of each month at Town Hall. Mechanic Street Streetscape Project – Project consists of streetscaping along Mechanic Street in Downtown Pendleton. Actions will include the installation of new sidewalks, crosswalks, lighting, and the addition of street benches, trees, and trash receptacles. We want to take a moment and update everyone on the status of this much needed project for Pendleton. This project is a direct result of the Downtown Master Plan and is the first phase of its implementation. To obtain the needed funding to accomplish this project, the Town received a $500,000 grant through the Community Development Block Grant program that is administered through the Appalachian Council of Governments. We are dealing with Federal, State and Local funds to cover the cost of this project. This also means we are dealing with multiple agencies to see this project to completion. Some of the agencies we are dealing with are the South Carolina Department of Transportation, Appalachian Council of Governments and the Department of Commerce. This project was given the Authorization to Proceed on September 1, 2017, and as long as there are no delays, scheduled to be a 180 day project. The project will result in new sidewalks, crosswalks, street lighting, public seating, plantings and repaving the street. One of the first hurdles and delay of this project was a storm drainage issue along with some elevation challenges. When dealing with these agencies, when a change needs to be made, you are looking at a MINIMUM of 30 days to obtain the needed approvals. Yes, sounds a little ridiculous, we know, but yes, it’s true. We also ran into underground storage tanks, and yes, you guessed it… more waiting to be able to deal with these. Not to mention the rain delays we’ve had to endure. We are now entering the final remaining stages of this project, which means we are getting a lot closer to its completion. Major sidewalk work continues, then back filling hardscapes and setting pole bases will take place. After that the light poles and electrical connections will be made followed by irrigation and landscaping. Final steps will be milling and repaving, striping and setting crosswalks and finally, cleanup of site. It is highly recommended that when the paving begins, you avoid this area as much as possible until finished. The final product will beautify a main area of Town and should drastically slow down traffic. We are aware a lot of you are concerned with the status of this project and want to assure you all, that just because you don’t see work taking place on site, does not mean work is not being done behind the scenes. Projects like this take patience on everyone’s part and we truly appreciate those of you who understand this. We have conservatively set a completion date of June 30th and believe it shouldn’t take that long. We are excited to see the final results of this project and hope you are too! Westinghouse Sewer Project – Project will replace a 40 year old pump station along with a 8 inch gravity sewer line and a 6inch force main. Gravity sewer will be upgraded to 15” PVC pipe and the force main will be upgraded to 12” PVC pipe. For after-hours, non-life threatening emergencies, call 864-646-9073.